Zen is the word at this 43,000-square-foot, wood-and-granite, open-air facility overlooking the terminal. Spread out at the 80-foot, aptly named Long Bar, or dine at one of four restaurants, including the Haven (strictly for first-class passengers) and a Japanese noodle bar. The Spa offers a complete line of services, but nothing tops the private cabanas, complete with personal showers, beds and oversized tubs. True road warriors, however, can spend their time on the wireless Web from anywhere in The Wing. 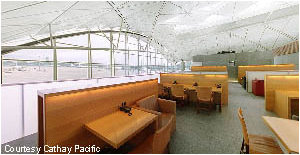 Shortly after SFO's International Terminal opened its doors last year, Virgin's $3.2 million Clubhouse followed suit. Most striking are the multicolored, floor-to-ceiling windows with sweeping views of the San Francisco Bay and the city's skyline. A rotating digital-art exhibit showcases local artists, and in an extension of the Upper Class "Freedom" menu, where you're free to eat whatever and whenever you want, the Clubhouse serves light snacks and entrees at any time of the day or night. Dubbed "an air travel environment for the 21st century," Terraces is indeed more backyard than board room, with trickling water fountains, the sounds of birds chirping, fully reclining lounge chairs under white umbrellas, and--no joke--the subtle scent of cut grass. A Molton Brown Travel Spa has hydrotherapy showers, reflexology treatments and specially designed pre- and post-flight massages. Service-conscious Singapore's 30,000-square-foot lounge accommodates 200 first-class and 450 business-class passengers. Tropical plants and aquariums abound, walls are covered with works by local artists, and 42-inch plasma screens show news and sports continuously. No time for down time? 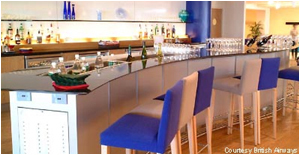 London's Heathrow recently opened the "Island," a pay-as-you-go airport lounge in Terminal 3. Open daily from 5 AM to 2 PM, admission is $36 per person and allows access to one of 29 showers, steam cleaning and shoe shining, satellite television, and Internet connections.